The police last night arrested four persons, including the estranged wife of one of the victims, in the Peepli murders’ case, where a family of four, including a widow and her four sons, were strangled to death while sleeping on September 30. Forced into marriage twice, she changed her name and religion but could not change her destiny. 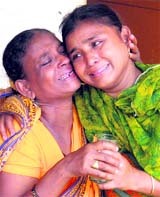 Ano Hara from Monitat village in 24 Parganas, West Bengal, and her sister Saira were lured into leaving their home by two villagers, Sidhi and Mansoor, on the pretext of getting them married. Acting on a petition alleging large-scale corruption in the purchase of sports equipment in Haryana, the Punjab and Haryana High Court yesterday issued notice of motion to the State of Haryana and other respondents for February 3. The standoff on the blockade on the Bhutiya minor by some residents of Sundana village persists, leading to an unrest among residents of neighbouring villages. The obstruction has not only created water shortage in some villages, but also stalled the process of dewatering of floodwaters in the area. Cotton ginners in Sirsa are expecting a good crop this despite inclement weather last month. The arrival of cotton has already started picking momentum. Over 20,000 bales of cotton have already arrived in the market. MP Deepender Singh Hooda today went on a whistle-stop tour of various villages of the Kosli segment of his Rohtak parliamentary constituency. BJP MP and Bharatiya Janta Yuva Morcha (BJYM) national president Anurag Thakur has asserted that Kashmir was an integral part of India and they would thwart any attempt made to detach it from the country. The CPM today staged a demonstration against the recent hike in the fares of buses of Haryana Roadways. The CPM activists assembled at the local Ambedkar Chowk and then marched in a procession to the mini-secretariat. A large number of farmers got tips on adoption of new and emerging technologies developed at the CSSRI for reclaiming of salt-affected soils, use of poor quality water, crop diversification, medicinal and aromatic plants and salt tolerant varieties at the kisan mela organised here today. A day after the release of Haryana Sikh Gurdwara Prabandhak Committee (ad hoc) president Jagdish Singh Jhinda and other leaders, detained during the “jail bharo” agitation, president of the rival faction of the HSGPC Didar Singh Nalvi accused Jhinda of sabotaging the separate gurdwara committee movement. The arrested include Sunita, wife of Jaspal Singh, Sunita’s father Surjit Singh, a resident of Amarpura Basti, Bathinda, Randhir Singh, a patwari from Desujodha village, and Balvinder Singh, a property dealer from Peepli village. Jaspal Singh (26) along with his mother Hardev Kaur (55) and two brothers Darshan Singh (23) and Hardeep Singh (20) were found murdered on October 1. The police produced them before a court in Dabwali today, where they were remanded in police custody till October 11. The police said the arrests had been made under Sections 302 (murder), 406 (criminal breach of trust) and 420 (cheating) of the IPC. The police believes that the murders were committed to grab 12 acres of fertile land of the family and all four accused were party to the crime. SHO of the Kalanwali police station Mahabir Singh said when the bodies of the victims were lying in the mortuary of the general hospital in Sirsa, these persons had allegedly taken thumb impressions of Jaspal Singh and Hardev Kaur to prepare some forged documents with regard to their property. He maintained that the accused wanted to take thumb impressions of all four deceased, but could not get the opportunity. He said the accused, Balvinder Singh, was known to both the families and had in fact acted as go-between in Sunita’s marriage with Jaspal Singh. Sunita and Jaspal had been living separately for some time due to marital discord. The killings had evoked protests in Kalawali, where villagers had blocked rail and road traffic on October 2 and the police was under tremendous pressure to arrest the accused. The fact of taking thumb impressions has come to light for the first time in the past nine days and even a doctor, who conducted a postmortem of one of these two bodies, denied that any ink marks were noticed on the thumbs of the victims. The SHO said the four had been arrested on the basis of suspicion, adding that even the next of kin of the victims had expressed their doubts on the accused. Mahabir Singh said the police had sought their police remand to recover the documents forged by them and to extract some other facts relating to the murders. Forced into marriage twice, she changed her name and religion but could not change her destiny. Ano Hara from Monitat village in 24 Parganas, West Bengal, and her sister Saira were lured into leaving their home by two villagers, Sidhi and Mansoor, on the pretext of getting them married. Abandoned by her first husband, Ano Hara was tortured, sent to Nari Niketan, provided medical treatment and remarried. Insensitive Nari Niketan officials and the district administration behaved in a cruel manner, forcing her to remarry despite her pleas that she was already married and wished to return to her husband and son. “I pleaded that I wanted to go back to my husband as I couldn’t go back to my parents who had no means to support me. But the officials kept saying that life alone would not be easy for me. Subjected to inhuman torture by her second husband, Ano Hara, whose name was changed to Aarti, approached the district officials for help. She was sent to MDD Bal Bhavan, Karnal. The latter sent her to the police. The police, influenced by her in-laws, sent her to the village sarpanch. With all doors shut, she knocked the door of the Deputy Commissioner, who sent her to MDD Bal Bhavan. With the administration abdicating its responsibility to trace Ano Hara’s (now Aarti) parents in West Bengal, a local NGO, Pravasi Suraksha Vahini, decided to do so. It succeeded in locating her family. Her mother Ayesha Khatoon was contacted by Raj Singh Chaudhry. Along with three persons from her village, she reached here today. It was a touching reunion with Ayesha Khatoon taking her daughter into her embrace after 12 years of separation. Amid tears, Ano Hara narrated her tale of woes to her mother. Ano Hara was brought to village Kumar in Bareilly district of Uttar Pradesh 12 years ago and sold to one Mahinder who forced her into marriage after changing her name. Mahinder would regularly beat her, at times with a pair of tongs. She became mentally ill. After she gave birth to a baby boy, she was abandoned on a train by her husband. She was spotted by GRPF jawans of Haryana who sent her to Nari Niketan, where she stayed for five years. Ano Hara’s mother said she would not let her daughter go back to her first husband. Karnal DC Neelam Pradeep Kasani said she would hold an inquiry to determine if Ano Hara was forced to remarry by Nari Niketan odfficials. “We will check the record and action as per the law would be initiated in case any lapse is found,” she added. In a public interest litigation placed before the Bench of Chief Justice Mukul Mudgal and Justice Ajay Tewari, Raj Kumar had asked the court to take cognizance of “large-scale corruption, fraud, scam and open loot of public money”. Directions had also been sought for handing over the investigation to an independent agency such as the CBI.Raj Kumar said: “The rates of sports equipment, by and large, are the same, all over India because the specifications of the sports equipment for national and international level competitions are the same. The petitioner said he was shocked and surprised when he received the information under the RTI Act. “A perusal of the documents would show that the Director, Department of Sports and Youth Affairs, Haryana, alone procured sports equipment worth Rs 402.15 lakh and Rs 323.30 lakh from respondent Ess Kay Sports and Punjab Sports House, respectively, at highly inflated rates during the past three years from the period 2007-08 to 2009-10”. The standoff on the blockade on the Bhutiya minor by some residents of Sundana village persists, leading to an unrest among residents of neighbouring villages. The obstruction has not only created water shortage in some villages, but also stalled the process of dewatering of floodwaters in the area. A meeting held today to resolve the issue yielded nothing. A complaint has been lodged with the police by the Irrigation Department against some residents of Sundana for “illegally” blocking the channel. The administration had recently began dewatering through this minor. 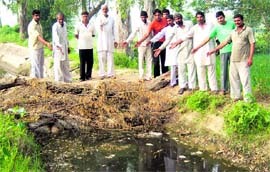 But the residents of Sundana village raised a dam, fearing that the floodwater would inundate their fields. The minor that starts from a site near Rohtak town stretches up to Masudpur village in the district, carrying water for both drinking and irrigation purposes. The blockade has resulted in various problems, including short supply of drinking water in Ballam, Timarpur, Kakrana, Sundana, Masudpur and Garnawathi villages, claimed Rajpal of Kakrana village. He said as the supply of fresh water had been halted, the draining of flood waters had also been adversely affected in these villages. On the intervention of the Kalanaur MLA, a meeting of various village panchayats and irrigation officials was held today, but no solution could be found. Dinesh Rathi, XEN, said though several meetings had been held, the problem persisted. Sirsa is considered the cotton bowl of Haryana, as out of the 20 lakh bales of cotton produced in Haryana last year, over 9 lakh bales were produced in this district alone. “According to the estimates, the total arrival of cotton is likely to remain almost equal to last year figures,” said Gurpreet Singh Nagpal, a partner in the Royal Cotgen and secretary of the Sirsa Cotton Association. He said last month’s rains had dampened the prospects of a bumper crop or else it would have been a record production this year. Gurdial Mehta, a cotton grower, who also owns a trading shop in the Sirsa grain market, said the loss to crop due to the rains was 10 to 15 per cent. “I sowed cotton on my entire stretch of land in Panjuana village. “The bolls that formed before the rains have survived, but those which were at flowering stage at the time of rains have withered away,” said Mehta. The farmers are getting fairly good prices for their produce. Nagpal said the price hovered between Rs 3900 per quintal to Rs 4050 per quintal. Last year, cotton was purchased between Rs 2500 (minimum) and Rs 3550 (maximum) depending on the local as well as export demand. Devender Sharma, a broker with an export house, said there was a good demand for cotton with exporters. Meanwhile, the cotton farmers are facing a crunch of labour for plucking. A farmer from Madhosinghana said the labourers were charging between Rs 325 to 350 per quintal. Last year the rates were Rs 275 per quintal. Accompanied by MLA Rao Yadvender Singh and other local leaders, he addressed public meetings, listened to the problems of residents of Uncha Neecha, Bohka, Mandola, Nimoth, Dhani Thetherbad, Lohana, Siha and Zenabad villages and directed the officials concerned for speedy redressal of grievances. Asserting that the state government, under the able stewardship of Chief Minister Bhupinder Singh Hooda, had been focussing on specialised development of education in the state, he said while a central university had been set up in Mahendragarh, a sainik school in Rewari and a central school at Bhalki village of the Kosli region, the establishment of a defence university at Binola village in Gurgaon district was on the anvil. Hooda junior was accorded a rousing reception by residents in the above villages. “Certain separatist forces are misleading Kashmir youths by instigating them to indulge in violent activities like stone pelting…Some vested interests are trying to sabotage the peace process by their provocative propaganda,” he said, adding that the BJYM would give a befitting reply to such things. Addressing the gathering at the India First campaign here today, Thakur remarked that Jammu and Kashmir Chief Minister Omar Abdullah’s recent statements on the status of the state indicated that he was talking like an agent of Pakistan. “He seems to be supporting the stance of the separatists,” he said and added that the Centre as well as the state government were responsible for the situation prevailing in Kashmir. Addressing the meeting, Haryana BJP president Krishanpal Gurjar also lashed out at Omar Abdullah and the National Conference and accused them of having adopted an anti-national and pro-separatist stance. State BJYM president Mahipal Dhanda and district BJP president Tilak Raj Malhotra were also present. Addressing the party workers, Harpal Singh, former MLA and a member of the state secretariat of the CPM, said the hike was like rubbing salt on the injuries of the poor already smarting under spiralling prices of essential commodities. He alleged that the state government had a plan to sell the Haryana Roadways, one of the profit-earning departments, to private hands. He said the recent hike in the bus fares was a part of the strategy to bring disrepute to the department to justify its privatisation. Krishan Swaroop Gorakhpuria, a leader of the All-India Kisan Sabha, alleged that the state government was bent upon finishing agriculture and all employment generation ventures in Haryana. Over 700 farmers participated in the mela. Besides free-of-cost water and soil testing, seeds of wheat varieties PBW-550, DBW-17, HD-2894, KRl-19 and mustard varieties CS 52, CS 54 and CS 56 were also sold. An exhibition was also held, in which all ICAR institutes located in Karnal, the Department of Agriculture, CCSHAU, Regional Station Karnal and other government/private agencies displayed their technologies and products. In addition, some NGOs and private companies also displayed their exhibitions on seeds, pesticides and agricultural implements and a Kisan goshthi was also organised in which scientists interacted with the farmers to solve their problems. Inaugurating the mela, chairman of the Farmers’ Commission, Haryana, RS Paroda praised the CSSRI for safeguarding the interest of the farmers particularly in NRM. He advised the farmers to adopt integrated farming model keeping in view the declining water table and small land holdings of the farmers. He urged the scientists to work for breaking yield barrier to feed increasing population. Dr SK Gupta, Director of the CSSRI, said about 1.8 million ha land had been reclaimed by the CSSRI technologies in the states of Punjab, Haryana and Uttar Pradesh. About 12 million tonnes of foodgrain was being produced annually from these reclaimed soils. He also elaborated on the recent initiatives taken by the institute, particularly in the field of multiple use of water for multi-enterprise agriculture, resource conservation technologies, energy plantations for bio-saline agriculture and medicinal plants in salt affected soils. As many as 16 farmers belonging to Haryana were awarded for their outstanding contribution to agriculture, besides prizes were given away to four best exhibition stalls. He said the entire focus of the HSGPC (rival) would be on asking every Sikh to vote for their candidates in the SGPC elections, slated early next year and ensure that not a single person of the SGPC from Haryana was elected. This would reflect the collective will of people of Haryana and strengthen the claim for a separate gurdwara committee and nail the lies of the SGPC that Sikhs in Haryana were with them, he asserted.